A closely followed dollar index recorded its biggest percentage gain in six months, as the currency's status as a haven appears to be trumping the Federal Reserve's dovish tilt. Mounting worries over global growth prospects are providing the dollar with the sort of haven appeal that's often reserved for the like of the Japanese yen or Swiss franc given that the U.S. economy is still holding its own - at least for now. The ICE U.S. Dollar Index is on track for a 1.1% gain last week, the biggest weekly percentage jump since August. On Monday, the trend continued and the gauge strengthened. The dollar at times follows the direction of U.S. government bond yields which are both perceived as a safe and very liquid asset but also sensitive to U.S. interest rate expectations, particularly at the short end. Yields, which move in the opposite direction of prices, have declined since last week's Fed meeting, as both lower rate expectations and global growth worries took hold. "Treasury moves are still leading the way for both equities and the U.S. dollar. 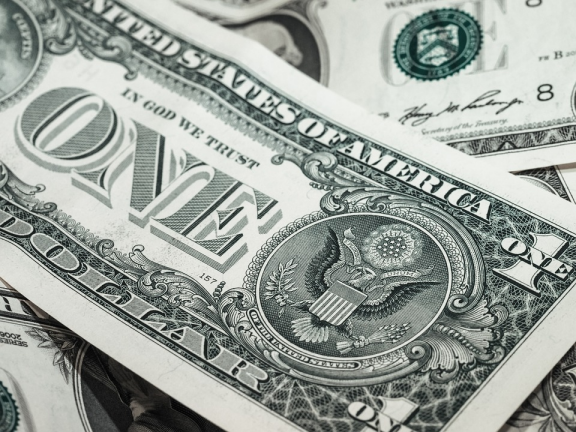 Treasury [prices] advance as risk aversion remained the dominant theme for the end of the week, with the greenback gaining on safe-haven flows," wrote Edward Moya, market analyst at Oanda. The Fed late last month surprised investors by striking a dovish tone at its first policy meeting of the year, signaling that interest rates were on hold until further notice just six weeks after having delivered is fourth hike of 2018. The move sent the yields and the dollar tumbling, while stocks rallied. The dovish Fed was expected to keep pressure on the dollar. After all, the opposite, hawkish, approach of the central bank helped the dollar all of last year. Currencies are commonly supported when domestic interest rates are moving higher, as stronger yields makes assets denominated in the currency a more attractive destination for investors. But even though the Fed stepping off the gas should ordinarily be dollar-negative, it might just be trumped by the worries of a world-wide slowdown. The European Central Bank last month said risks to the eurozone's economic outlook had shifted to the downside, while the European Commission last week slashed its outlook for growth across the region. The Bank of England last Thursday forecast 2019 U.K. gross domestic product would grow at the slowest pace since 2009. And concerns remain over the prospect of a hard landing for China's economy as it deals with a host of headwinds and the trade dispute between Beijing and Washington. Meanwhile, history shows the dollar tends to perform well when the global economy doesn't, though market participants stressed that this thesis only holds as long as the U.S. economy withstands a slowdown of its own. And for now, the U.S. economy still looks healthy, particularly in comparison with its peers. A strong January jobs report, for example, led the dollar higher last week, outweighing the Fed's calls for patience that had pushed it down just one day before. That being said, many expect softer U.S. economic data in the second half of the year. "With the United States tackling headwinds in the form of trade tensions, global growth fears, fading fiscal stimulus at home and political uncertainty in Washington, dollar is certainly vulnerable to downside shocks. Any signs of the U.S. economy experiencing a slowdown will most likely accelerate dollar depreciation as its safe-haven status is questioned," said Lukman Otunuga, research analyst at FXTM. Meanwhile, the more pessimistic are penciling in a recession by 2020, arguing that the Fed's decision to pause will end up marking the end of the hiking cycle and that the next rate move will be a cut.